How to prune an apple tree? Of all deciduous fruit frees, one of the most frequently asked Q's on the net has to do with pruning apple trees, and pruning apple trees is quite the same as all deciduous trees, just follow these guidelines and basic rules. Cup shape - like with most deciduous fruit trees try to maintain the 'wine cup' shape as closely as you can. 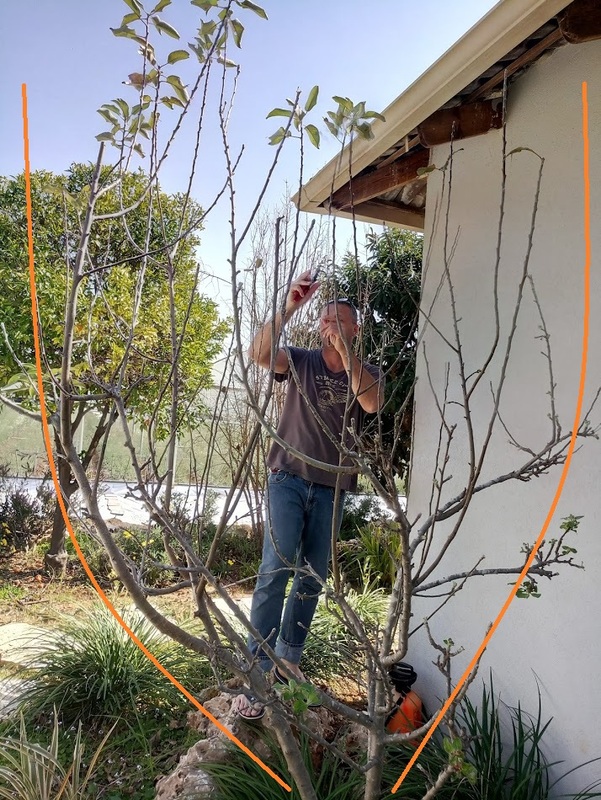 See the orange lines I marked on the picture, the cup shape allows for good air circulation in the tree's center, which is good for the tree's health, and will allow for easier access for maintenance. Keep the height - as soon as fruit begin to grow you'll become familiar with one of the most important things regarding the cup shape and pruning - fruit picking. There is no real benefit if the fruits are so high that you can't reach out your hand and pick them. Pruning apple trees for maintenance - cutting and removing old or dead branches can be done throughout the entire season. Although it is common to do so during winter after the leaves have fallen to enable a better view of the tree's structure. A naked skeleton always allows for better decision making regarding what should be pruned. The following picture shows you that I chose to cut a cross branch, which grew towards the tree's center and as we want the center to stay clear and clean, the cross branches can go. maintenance is easier in the winter because it's difficult to maintain clarity when the tree is covered in leaves, which is the case in the summer. 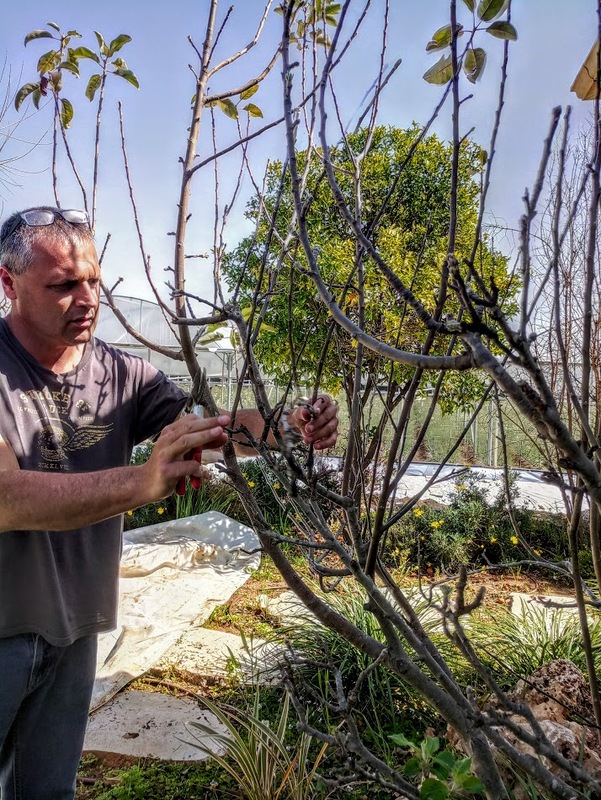 Pruning to get the most from your apple tree - When it comes to deciduous fruit trees, the benefit is clear... its all about the fruit (yes, and the blossoms, the shade etc.,but lets be honest - we want the apples). So, to get the best and most yield from your tree you need to keep it at a certain height (just as you would see in an orchard). See the picture above - it's all wrong. The tree is way too tall, the branches are too thin and there is little chance that it will yield apples - wont be able to carry them on those stick-like limbs. In the state it's in (I'm referring to the height) the tree simply can not get the required energy to produce quality fruits. So what is one to do?? Keep the tree at a reasonable height. I generally recommend no taller than you + an arms length, this will ensure you can always reach out and pick the fruit. At this height the tree will be able to direct enough energy to produce the quality fruit you hoped for when you planted it, and potentially at much larger numbers. When to prune? The best time would be in dormancy when the tree is in sleep mode and naked. However, there is nothing wrong with pruning just as spring begins, and plants start to awaken. If you look closely at the picture you will see a few new buds and some old leaves at the top of the canopy (these leaves have been there since last season, and although we want the tree to be naked, it's OK if it's dressed with just a few old leaves). First, the tree is too high and I'd like to reduce its height (for all the reasons I mentioned earlier). On the other hand, the tree has just started to show new growth (I'm so happy it's spring :) so it's not a great time for hard pruning. So, what I have chosen to do was to leave the tree as is for now and only do maintenance pruning. I removed old branches, as well as the two inner branches i'm holding in the picture, because they were growing towards the tree's center (which we want to keep clear). Next season I'll prune the tree's heights. 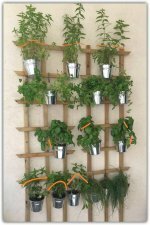 How to prune? Dead, old or dried branches should be pruned as close as possible to their base. Live green stems and branches should be pruned (approximately) half an inch above their base. My preferred pruning shears: Pruning apple trees can be tough. Even the small dried twigs can give you a hard time. I would use short blade bypass pruners that can handle the challenge and are also good for the small stems. For thicker branches, a 1/2 inch or more, I would recommend bypass loppers – they will make the hard work easier.